Spotlight: TDK Lambda’s Z+ 200-800W Programmable Power Supply – DC power supply, function generator, communications ALL IN ONE! 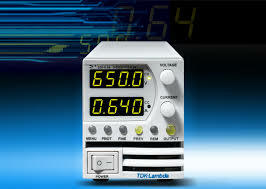 Control Sales is proud to spotlight TDK-Lambda’s Z+ Series of 200 to 800W programmable DC power supplies. These high-density, high efficiency, 2U format, bench-top and rack mountable power supplies are designed to meet the demands of a wide variety of ATE, Laboratory and OEM applications, including: Test & Measurement, Semiconductor Burn-in, Component Test, LED/Laser Test, RF Amplifiers, Electromagnetic and Electrochemical applications. Z+ has ability to create and store up to 4 application specific test waveforms removing the need for an external controller in basic simulation tasks. Up to 12 values can be programmed using the waveform creator software provided and 4 waveforms can be stored in the Z+ unit’s memory. More complex waveforms can be created using LabView®. These waveforms can be either repetitive or single-shot.